At Arkham Asylum, Professor Pyg puts a record of Ave Maria on a gramophone. The other patients in the rec room are mostly calm except for one inmate who demands he turn it off because his mother used to beat him while playing it before he killed her while also having the song on. Pyg goads the inmate into attacking him to which he responds by snapping a record in half and killing the inmate with him. Back at the GCPD, Jim and Fox examine the X-rays for Pyg which reveal that he has had numerous facial surgeries that prevent them from knowing his true identity. Jim asks Fox to work on trying to trace Pyg's origins. Jim heads out to his office where Sofia is waiting for him. She wants to continue their relationship and says that despite Oswald knowing about her buying Jim's spot as Captain, she has everything under control. Jim is upset to learn that Oswald knows about her bribery and remains uninterested in pursuing a relationship with Sofia. Lee is hard at work as the new club leader in the Narrows. She has formed a court to bestow justice and settle disagreements amicably. A man comes in with a face injury, having been beaten by a gangster named Sampson. Ed suggests she send Grundy to beat him into staying in his own territory. Lee is weary of using brute force to enforce order when she's trying to keep things somewhat civilised. Sofia returns home to find Oswald and Zsasz waiting for her. Oswald confronts her for lying to him and having a secret relationship with Jim. She tries to deny it but when Oswald presents further knowledge and evidence of her dealings with Jim she admits it, only to be further frightened by Oswald bringing in a torture specialist called The Dentist. Jim vists Pyg in Arkham Asylum and goads him into revealing a Southern accent that gives Jim a lead to follow in tracing his origins. Lee and Ed confront Sampson in his neighbourhood for trying to move in on her territory. She offers to pay him off of moving in but Sampson insists that he'll be taking her club and her neighbourhood by force. She offers to treat his coughing up blood and the other sick people in his neighbourhood, and he agrees to come by her clinic to begin treatment as well as demanding that he'll get 30% of the Fight Night profits. Sofia convinces The Dentist to help her escape by threatening him and his family but she is promptly kidnapped by Barbara, Tabitha, and Selina. They want her to convince Oswald to not kill them but Sofia reveals that Oswald just tried to kill her because she is very close to taking over his underworld empire. Sofia says that if they let her go, Oswald will be dealt with. Barbara still wants to ransom Sofia back to Oswald. Owald is talking to Martin who claims that Sofia made him lie about kissing Jim. Barbara calls to ransom Sofia back in exchange for her demands and he agrees. In actuality, he sends Zsasz out to kill all of them. Zsasz shoots a bazooka at the building but the women are able to escape out the back before it hits. Barbara swears revenge on Oswald. Sofia vists Jim at the station and claims Oswald just tried to kill her and emotionally pleas for Jim to use his position of authority to take Oswald down. Jim deduces that Sofia is just trying to get him to kill Oswald for her as the final move in a multi-stepped plan she conceived of. Jim visits Oswald instead, sharing how Sofia visited claiming he tried to kill her. Jim doesn't want to arrest Oswald but is offering a deal that will result in Sofia leaving Gotham at nightfall and Oswald will be able to continue ruling his empire. Lee and Ed return to the clinic and find it has been badly destroyed. Ed suggests she send Grundy to kill Sampson but she declares she has a better idea. She visits Sampson once more with Ed and tells him he needs to clear out of the Narrows by nightfall. She presents an antidote and tells him she had his drink poisoned. She will only give it to him if he leaves by the end of the day. He agrees. Jim has Sofia arrested and escorted to the train station by another detective with the condition being that if she doesn't leave and stay gone, she will be put behind bars. Oswald is informed by Zsasz that Sofia has boarded her train, and then discovers that Martin has been kidnapped. Zsasz is sent after Sofia's train and discovers that she orchestrated Martin's kidnapping to ensure she'd escape. Sofia, Barbara, and Tabitha have Martin in their custody. Sofia wants to meet with Oswald. At the meet, the women have Martin in their clutches and Sofia demands Oswald turn over his empire or else she will kill Martin and him too. Oswald submits to Sofia's demands and Sofia gives Martin back. Oswald apologises to Martin for getting angry at him, then tells him to get into the car. He then tells the women that Martin will no longer be used as a pawn and then blows up the car. He declares that war has begun. The women are forced to retreat as gunfire erupts. Sofia tells the other women that they will win this war against Oswald. Lee tells Ed that the side effects from being frozen have now dissipated. She held off on telling him because she likes seeing him return to the man he once was as opposed to the cold killer. He is more like the man she was friends with before. Oswald is revealed to have orchestrated a scheme to fake Martin's death. He tells Martin he needs to go with Zsasz to somewhere outside of Gotham to stay safe, though Martin doesn't want to leave Penguin. 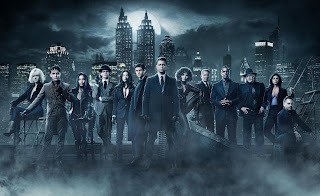 Zsasz is skeptical of his needing to be the one to take Martin out of the city, believing he should be sent after Sofia, but Oswald assures him that he has something more insidious in store for Sofia. Fox successfully reconstructs an image of what Pyg used to look like and by using Jim's lead into the Southern area, they're able to discover his previous identity as Lazlo Valetin. Lazlo was a serial killer in the South but didn't go after police officers nor did he have this "pig" persona. The case against him didn't fall apart but Lazlo escaped before they could put him on trial. Jim orders an extra guard to be placed on Pyg but when he arrives at Arkham to question him further, he finds that Pyg ha killed a guard and escaped, leaving behind the message "It's been fun James - Lazlo". Meanwhile, Ed begins having hallucinations of his Riddler persona.